Back in the day a large plantation owner on Kauai bought a whole ton of trees for his plantation. Turns out he bought way too many so he donated the rest to Kauai. 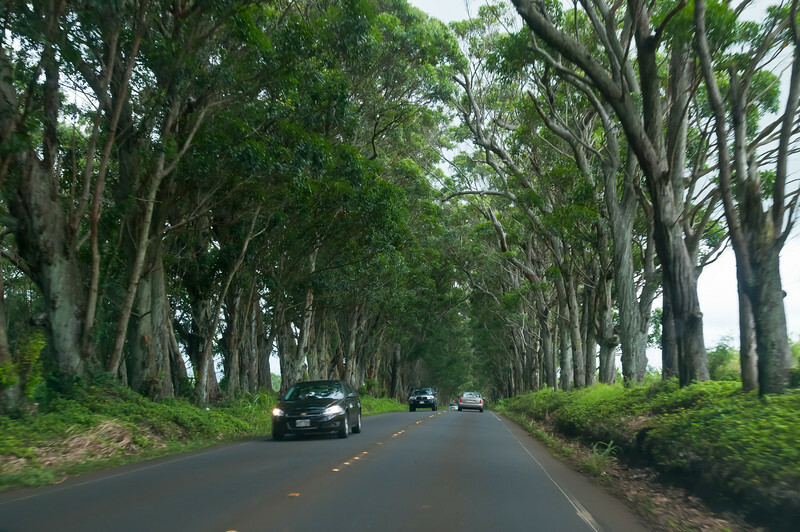 They planted them along the end of the road from Poipu to Lihue and now the trees form a "Tunnel of Trees" along the road. The branches used to be intertwined but the hurricane in the 90's destroyed a lot of the branches/leaves. There wasn't really anywhere to pull over in the tunnel of trees so I had to take this shot while sitting in the front of a moving car. 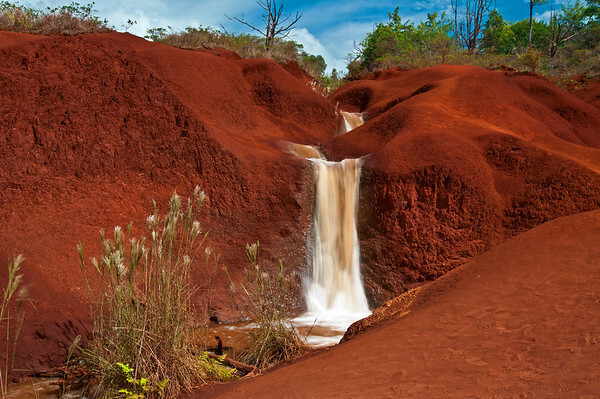 On the road up to Waimea Canyon we saw this neat little waterfall with some awesome red soil and decided to pull over. I took this long exposure waterfall shot after hiking down to the little falls. While stopped to take the picture of the neat little waterfalls (see previous photo) we got our first glimpse of the view of Kauai. I thought it would be neat to capture Lillian taking her own photo of this, just so you can see how huge this area is. 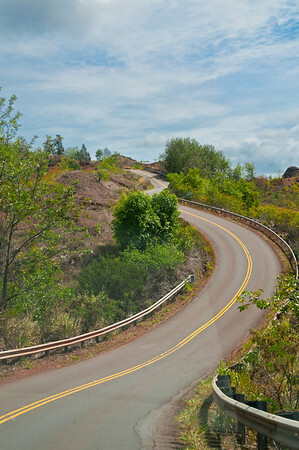 The road to Waimea Canyon was a little curvy and twisty and we saw this neat view of the road that I had to snap a photo of. Hailed as the "Grand Canyon of the Pacific", Waimea Canyon was formed over many many many years of water erosion on Lava Rock. 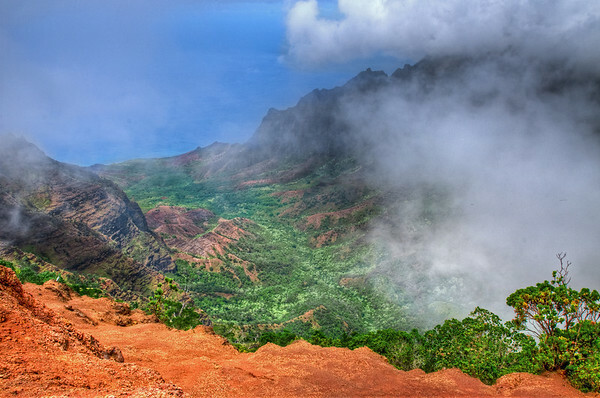 We stopped at the Waimea Canyon Lookout and I took this 12 shot panorama. 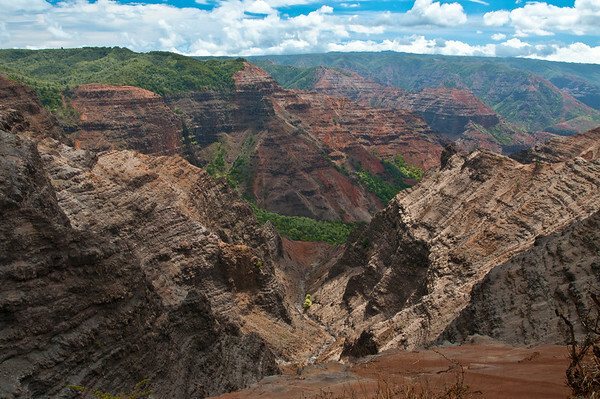 Hailed as the "Grand Canyon of the Pacific", Waimea Canyon was formed over many many many years of water erosion on Lava Rock. 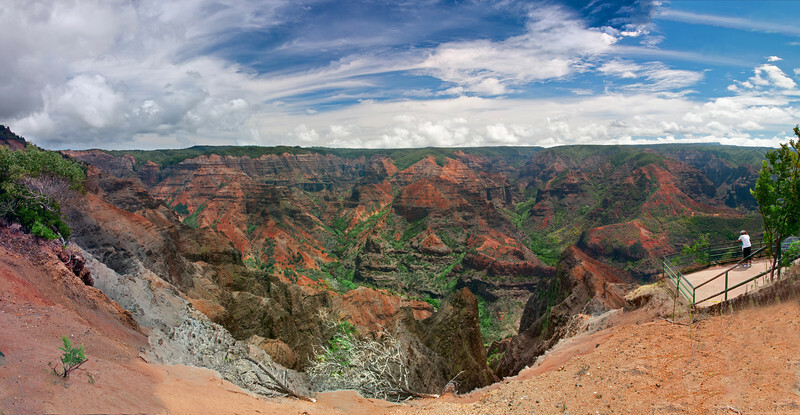 We stopped at the Waimea Canyon Lookout and I took this 14 shot panorama. This was taken at the little viewing area that you can see in the bottom right of the previous panorama. The photo covers about 180°. 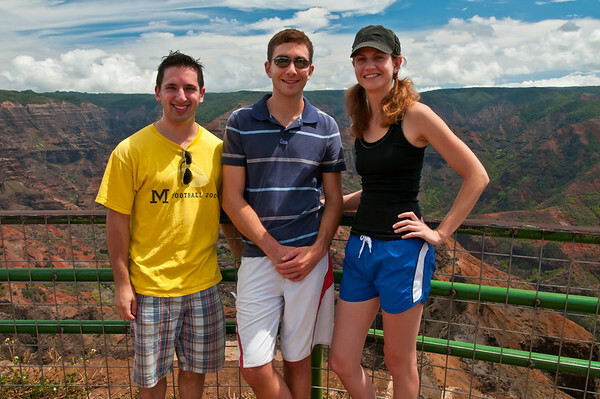 The 3 of us in front of Waimea Canyon, the Grand Canyon of the West. 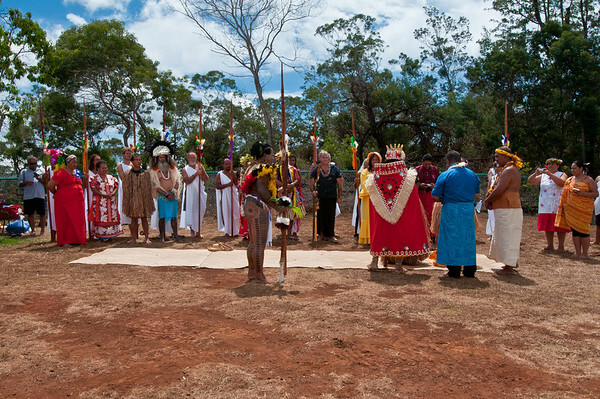 Near the parking lot at the Waimea Canyon lookout a bunch of native hawaiians were putting on some kind of show. 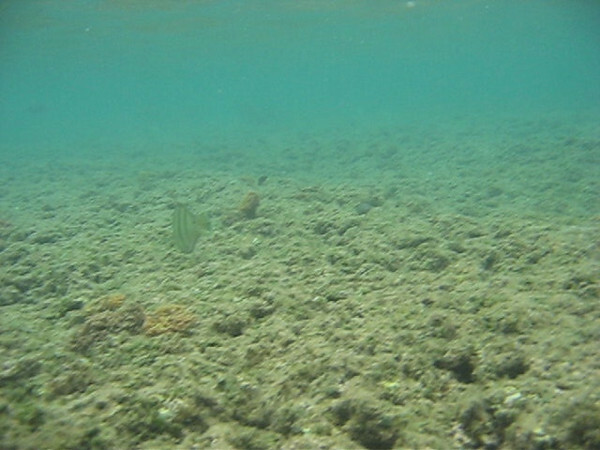 We decided not to stay and find out what it was, but I did takke a photo of them . 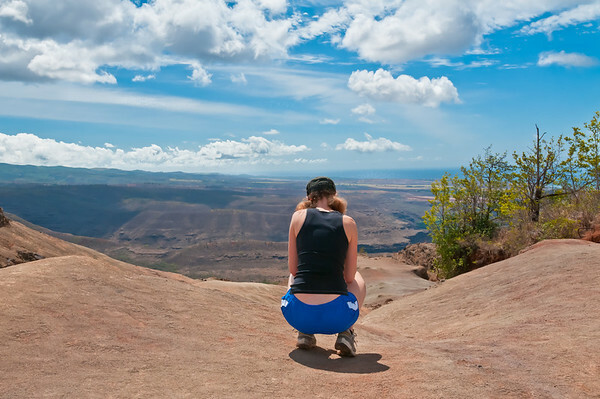 Another view of Waimea Canyon, seen from a different lookout. You can see where the river used to run way down below. 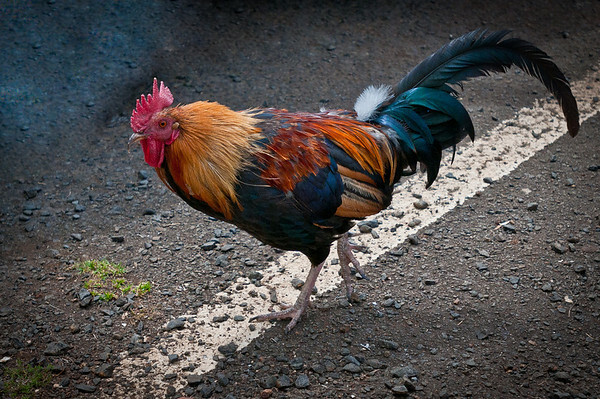 In the 1990's a giant hurrican hit Kauai and one of the results was that numerous chickens escaped from their pens. 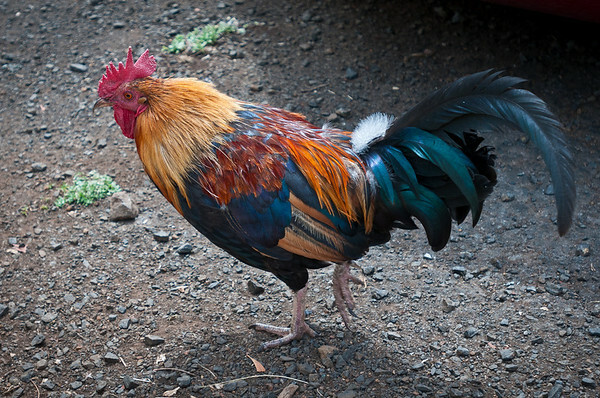 The entire island is filled with Wild Chickens roaming all around. At the parking lot at one of the lookouts we found many of them trying to attack us for food! At the very end of the Wiamea Canyon road is the Pu'u o Kila Lookout. It supposively has some of the most amazing views in the Pacific. Unfortunately we took our time getting up to the top of Waimea Canyon and the clouds/fog had rolled in. We hung out for about 20 minutes and for 30 seconds the clouds cleared enough for me to snap this photo. We hiked around up here for another couple hours but the clouds never broke. I suppose we were lucky I was even able to grab this photo!